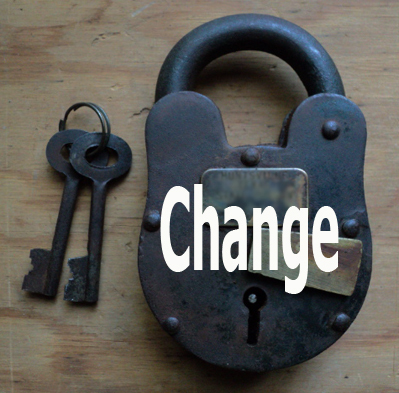 As our lives get increasingly busier and more complicated, People talk about doing better, getting more out of life, and so forth, yet one word represents the lock on our prison door: change. We’ve heard it before: change is scary, change is necessary, change is good. Our personal relationship to the word change drives our attitude about it. You’re either drawn to it or repelled by it, and few of us examine our relationship to the word itself. What do we really want, and why do we believe change is necessary? What specifically do we believe we need to change? We usually look at our behavior first, as this is what gets pointed out to us by others. This can inspire us to enroll in workshops and seminars, or see therapists or coaches. Unfortunately, by handing our change over to others, we’re replacing behavior that doesn’t work for us, for another that was promised to work for us by someone else. Handing over your power usually backfires one way or another over time. Taking the power back requires recognizing that Behavioral Change is only difficult when it’s an external thing; something we have to put on until hopefully it fits, or we get used to it. Either way, we know we’re not going to like it, and we resist. We don’t want to give up what we already like or fight the physics of our own momentum. (According to Newton’s First Law of Motion there is a natural tendency of objects to keep on doing what they’re doing. All objects resist changes in their state of motion.) If we’re doing what we do because it’s a habitual response, we’re in motion, and our natural resistance makes change difficult. What if we don’t play that game? What if we don’t buy into change being the answer? What might be the alternatives? The obvious first answer would be to remain exactly as we are. If you are spectacularly happy and successful at everything, remaining as you are makes good sense. If things are not working out for you the way you’d like, you’re usually told that you need to change. There is however a third alternative. When change is perceived as going from who you are to who you want to be, change is difficult at best - impossible at worst. This is why 99% of all workshops, seminars, therapists and coaches fail to facilitate your change. There’s simply too much resistance for too many reasons. On a deeply psychological level, there’s a sense of having to destroy who you are, to become who you want to be. This is a very difficult and painful thing to do, and in this author’s view, wholly unnecessary. The third alternative is a deceptively simple, organic way. Renaissance artist Michelangelo believed that the job of the sculptor was to free the forms that were already inside the stone. 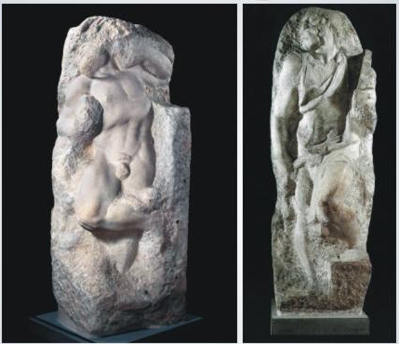 He believed that every stone had a sculpture within it, and that the work of sculpting was simply a matter of chipping away all that was not a part of the statue. This is a remarkably effective approach to coaching as well. Rather than all the resistance, effort, and unsure results that go with change, we could relax and become our True Selves. This solves a plethora of issues. When we can become our True Selves, chipping away all the excess nonsense to reveal the beauty within, our natural behaviors rise to the surface. Virtually all the behaviors that aren’t getting you what you want in life are associated with that outer shell of Self. Your True Self, behind all that stone would make different choices, take different roads, and would be more in touch with what brings you deep, real fulfillment. So what if we look at all that stone you’re trapped behind as a prison, keeping you from the life you want? 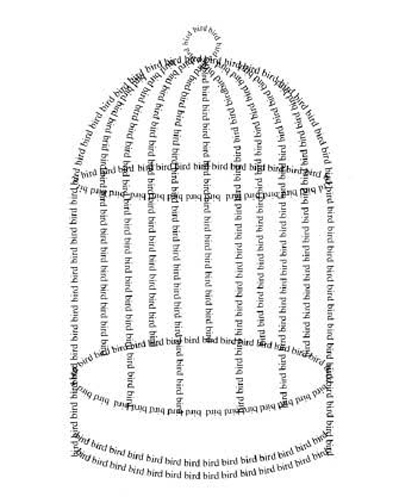 In this prison metaphor, the walls consist of all the words and stories we tell ourselves to define ourselves. We existed before the stories, and would not cease to exist without them. They’ve become our moveable prisons. This is important: the more we define ourselves by these stories, the more we confine ourselves by them. We have so much more potential. The self-talk and stories are merely the words we’ve learned and chosen to build our prison walls. We came up with them, so we have the power to get rid of them. A great deal of the discomfort and stress we feel is due to a kind of friction between our inner True Self and what we present to the world. We may not even be aware of this anymore, as we’ve grown accustomed to our prisons and presentations, but not being at home within ourselves leads to the choices and behaviors that frustrate us. By shedding the words and stories that are extraneous to our True Selves, we’re freed of the prison. Furthermore, by learning the native language of our True Selves we redefine ourselves as such. We can make choices and act from a place of authenticity and integrity. This brings your internal and external self into congruence, which alleviates that friction. Everything in life becomes easier without friction using up our energy. You’ll have more to direct to your true purposes. This is basically just increasing the efficiency of your own energy/power plant. When we have more energy, and are free from our old prisons to choose where we put it, we can accomplish amazing things. Chipping away the excess stone that imprisons you, and releasing the real you to fly as high as you want is far easier and more lasting than change. Getting more from who you already are, allowing the real you to excel without encumbrances is called getting Optimized Results. People have funny reactions to your requests. They generally assume them to not be in their own interest, that you’re going to take something away, or in some way be problematic. This comes from their general preoccupation with themselves; a vestige of childhood. Work with that. Rather than using a direct approach (unless you have an established relationship with someone where this has been pre-approved) look at the bigger picture. How can what you want or need benefit the other person? If you can’t figure out how it benefits more than just you, maybe the want or desire could use a little closer examination? If I want you to go with me somewhere, I probably would prefer if you wanted to go, rather than merely agreeing to go. That requires me checking in with you on how you feel first, before expressing what I want. This takes a bit of practice, but taking the high road becomes habit, and circumvents many arguments. on Sale thru the end of January!